The White House said Monday that earlier sanctions on North Korea remain in place after President Donald Trump decided to hold off on additional ones. Trump announced via Twitter on Friday that he had ordered the withdrawal of additional large-scale sanctions on the North. It was unclear whether he was referring to Thursday's sanctions on two Chinese shipping companies accused of helping the North evade sanctions or new sanctions that had yet to be announced. 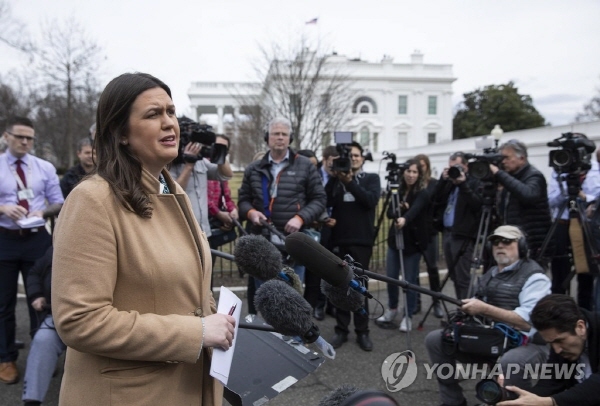 "Look, the sanctions that were in place before are certainly still on," White House press secretary Sarah Sanders told reporters outside the White House. "They are very tough sanctions. The president just doesn't feel it's necessary to add additional sanctions at this time. Nothing else to add." Pressed to answer why, she said: "Like I said, the president likes him. They want to continue to negotiate and see what happens." Sanders was referring to her statement Friday in which she attributed Trump's decision to the fact that he "likes" North Korean leader Kim Jong-un and "doesn't think these sanctions will be necessary." The announcement came as negotiations to dismantle North Korea's nuclear weapons program have hit an impasse following the collapse of last month's summit between Trump and Kim in Vietnam.